Waddell Dowel Pin, Spiral Groove, 5/16 in Diameter, 1-1/2 in Length, Clipstrip Selected clear hardwood plugs, unfinished, smooth sanded and tapered. Selected clear hardwood plugs, unfinished, smooth sanded and tapered. Unfinished hardwood plugs. Unfinished hardwood buttons. Unfinished hardwood buttons. Smooth satin finish. Packed in fiber carton. Made from Aspen hardwood. Waddell Dowel, Square, 1/4 in Diameter, 36 in Length, Hardwood Fits tightly into a corresponding hole to fasten or align two adjacent pieces. Waddell Dowel, Square, 1 in Diameter, 36 in Length, Hardwood Unfinished hardwood plugs. Smooth satin finish. Packed in fiber carton. Made from Aspen hardwood. Fits tightly into a corresponding hole to fasten or align two adjacent pieces. 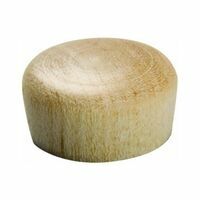 Waddell Screwhole Plug, 3/8 in, 4 in Overall Length, 4-1/2 in Width, Round Head, Oak, For use to cover screw holes completely Unfinished hardwood plugs.